I’m writing this onboard BA48 from Seattle to London after attending my first international Tableau Conference. My mind is still buzzing after such a great week, packed with emotion, knowledge, pride, fear and more. I’m going to try and make sense of the week by attempting to document my key thoughts and takeaways. Maybe some of them will apply to others, I’m not sure. Right from the off it was apparent that Tableau have chucked a whole load of cash at this event. The conference venue was huge, brilliantly decked out in Tableau colours. Helpful signs were everywhere, as well as tons of eager Tableau employees all dedicated to making sure you got to where you wanted to go. There were refreshments whenever you needed them, tech stations, games and all the requirements you needed to work, rest or play. The keynote arena was phenomenal and created an electric atmosphere. I loved the keynotes. Brilliantly relevant subject areas, from passionate and engaging speakers. Particular highlights were John Medina & Neil deGrasse Tyson. I imagine that caliber of speaker doesn’t come cheap though! A fantastic effort and one that really made me feel that this event was critical to the company. So many Tableau guys and girls around to help us navigate or fix any issues. We were guided into the arenas and shown exactly where we needed to go – it required no effort and no scrutinizing of maps and guides. I also found great help when setting up for my speaking sessions. Expert tech-checks, and attentive audio-visual assistance got pretty much any problem resolved is super-quick time allowing me to concentrate on my talks. There was also great help from my assigned Tableau partners for my speaker sessions and other interactions. Big thanks in particular to Morgan and Jewel for helping me out. Messages, updating schedules, announcements and much more, the data14 app was a key companion for the whole week. Also very useful for the organisers as well I imagine, with the favourites function allowing them to gauge potential interest in talks and allocate rooms accordingly. Don’t get me started on that gameon thing though. What a nice city. I flew in a couple of days before the conference so had a good look around, including a great tour of the area in a seaplane (flown by @cheeky_chappie(!). Some stunning scenery and a great chilled out vibe. And that’s not even mentioning the greatest music scene ever (I’m a bit of a grunge kid at heart). We also went off to the ball game which was cool. I lost count of how many times I said that. 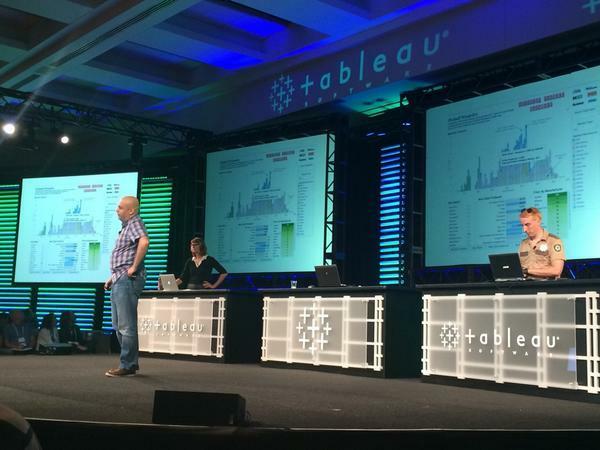 The opportunity to meet and thank members of the Tableau community was my top takeaway from data14. I must have met several dozen people that I’d been regularly interacting with over the last year. I’d be here all day if I mentioned everyone but meeting Ramon Martinez (@hlthanalysis), Mark Jackson (@ugamarkj), Emily Kund (@emily1852) and Kelly Martin (@vizcandykelly), and being able to thank them personally made me feel incredibly happy. Despite learning an absolute TON of new skills at the conference I still left feeling that I’m faced with a mountain to climb. So many insightful, passionate, and clever people. I met many of the Zen Masters also, and was very humbled by their skills and also by their willingness to pass the skills on. In fact my first lunch break featured an impromptu masterclass in data densification from Jonathan Drummey. Superb. Yes that does contrast with the previous thought doesn’t it. How come? Well if I think about it then several hundred people came to see me speak across my 2 sessions. Lots of people stopped me and asked questions about my blog articles and other presentations etc. In fact I couldn’t go anywhere without being stopped and engaged in some great data conversation. Then on the final day, a data fan stopped me and told me that my work, blogging and community interactions have helped him to get out of bed every day and do a better job. That was fabulous to hear. If a little surreal. So I left thinking yes I do have tons to learn and take in, but I’ve also got my own skills that people want to hear about. I used to be scared about presenting. Not with the Tableau Conference. The community is so strong that it’s like presenting to a group of friends. I was lucky enough to be able to present 2 sessions and both were a great thrill, despite a couple of technical hitches! So if you think you’ve got a Tableau story to tell then try and get involved. Tableau open the speaker applications early in the year so look out for it. You’ll love it. So those are my thoughts on data14. I’ve been to dozens of conferences. None have been like this. Many companies don’t sign off on conference attendance as they are often seen as a waste of time. And many are. But Tableau events are better training than any classroom course and I’d say invaluable to anyone that wants to make a career in this fantastic field. See you in Las Vegas 2015! This entry was posted in Events and tagged conference, data, data14, IT services, tableau, thoughts, viz, zen master by paulbanoub. Bookmark the permalink. Great meeting you Paul–can’t believe how quickly you got this up! Cheers, new friend. Paul – excellent post. Despite this being my first foray into the conference, I was in awe with everything that went into it. Most of all – the people were great – from Tableau employees (like my Product Consultant / Tableau Doctors / everything) to the attendees (just so many diverse backgrounds and stories). I loved it and will come back every single year. It was excellent running into you at the Hilton on Thursday – I really appreciated our discussion and hope to see you again next year!! Keep on keeping on. Thanks for the kind words. It was great to speak to you. Feel free to connect anytime & see you on Twitter. You are spot on about the Tableau community; it may be the greatest asset they have beyond the product. It was great to meet you, and I sincerely appreciate your willingness to share ideas, make introductions, etc. One of my conference highlights was making new friends like you ! #9 is my favorite. Keeping that culture during exponential growth is a massive challenge. I hope they find a way to continue to exceed expectations during the coming phases as well! Thanks for sharing your thoughts! I consider myself very fortunate to have met you and @cheekie_chappy at #data14 and I look forward to reading more of your blog posts in the coming year. And I agree with you and @vfitz about #9, how will Tab keep the magic going? I guess that’s something we can talk more about at #data15.